Is Underwater Childbirth Safe? Some Doctors Say No. Why is this important? Because there are presently 143 birthing centers in the U.S. that offer underwater births to pregnant women. In fact, 1% of all births in the United Kingdom are immersion. While some research claims that these births are safe, experts think otherwise and state that the number of women studied was too small to detect rare but potentially harmful outcomes. 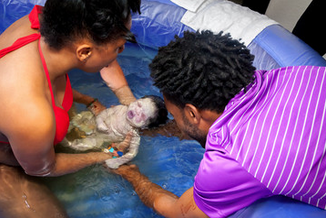 Should women give up immersion births completely? Probably not. The experts think that a woman may stay in these tubs during labor but should NOT push or deliver the baby underwater. They also recommend stricter protocols, patient selection and infection control. If you like what you’ve read, please subscribe to the blog, like me on Facebook, or follow me on Twitter.